I would like to know if you hold Genesis prayer seminar in London? If so, where, when and how much (if costs apply). Can not figure out the calculation of Pi derived from 1st sentence of Genesis (p.24 @ There is nothing random about the universe). Ps(28 letters) & P(words). Can you explain? More, and very interesting: 1820 are the exact total number of the Holy name ,יקוק, in Torah. Ring a bell? Pingback: Kabbalah: Beyond the Boundary » Metatron in the Beginning and in the End of Days. Pingback: Kabbalah: Beyond the Boundary » The 8th Day of Chanukah; All the Lights are Lit. Now I am no scientist but any one can see by using a calculator that 1.61803399 x 2 = 3.23606798. Pingback: Torah Perfection | Evoking the Light that Reforms! While, I’ve never heard of anything such as you’re describing “Kabbalistic personal numbers and Great Fortune numbers,” you can find the earliest reference to gematria and the letter values in Abraham, the Patriarch’s Sefer Yetzirah, written 3700 years ago. Aryeh Kaplan’s Sefer Yetzirah, published by Weiser does a great job translating and explaining it. Pingback: 666 and the Mark of the Beast continued… | Evoking the Light that Reforms! L(n) = 1, 3, 4, 7, 11, 18, 29, 47, 76, 123, 199, 322, 521, 823 …. phi^8 = 46.9787137522 = L(8) – 0.021..
phi^12 = 321.9968942608 = L(12) – 0.0031..
phi^19 = 9349.0001014858 = L(19) + 0.00010..
phi^20 = 15126.9999245637 = L(20) – 0.00007..
As you can see, there is nothing special or unexpected about the 18th power. Thanks for pointing that out. Nevertheless, 1st of all they only start meeting our definition (3 decimal places) at Phi^16, L(16), but if you don’t think 5778 is unique (or rare) consider this, phi^18/L(18) or 5778/18 = 321 exactly, an integer. Please try running that through the Phi/L sieve and see how many then qualify, none other through phi^20 to be sure. The point is that the interaction of Phi and Lucas numbers just adds to the beauty of mathematics and the universe’s design and again distinguishes 5778 as a special number. 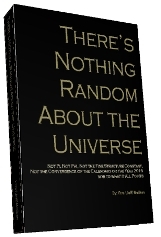 I rea the “There’s Nothing Random” book. Wow! What a work of art. He only problem is mentioning the Christian Messiah–for what? As Jews, we know he wasn’t the messiah n that we cannot even mention his name (don’t mention names of other gods…). Anyway, about ur 666, I don’t think it’s a messianic code. According to Christianity, doesn’t it have to do with some kind of anti Christ? Great book, bu no need to use Christianity or Islam to validate ANY of our beliefs. To the contrary, THEY need to prove themselves, not the other way around. 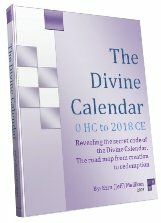 I started reading “The Divine Calendar” and notice that you state the year for destruction of the first temple as -422 GC. Why is it that most other publications state the date as 586 BC for the destruction of the temple and start of the exile to Babylon. Actually, most credible sources give 3338 HC (which is -422 BCE) as the date for the destruction of the Fist Holy Temple. It’s certain academic sources that give -586 BCE as the date, based on a time-line of their own arbitrary creation. Historically Torah scholars have always used the date 3338 HC. Can you tell me of any verse within Torah that equal 62,650. this is the total of five word times 70; the 895 comes from Shemot 30:11 the phrase is in the Torah 70 times, this is why I am asking, it has to do with Ki Tisa and the gathering of the seed of Avraham. I appreciate your help in advance achi, Shalom! Pls look up the article I wrote on this verse and the 70 times it appears. It was one of my first for this site. I wrote it for Rav Brandwein of blessed memory. There is no verse nearly long enough to have such a high gematria value as you seek but there may be a paragraph which would be hard to find unless divinely inspired.